or even better, utilize ZagTrader's powerful back office instead! With the ZagTrader Buy-Side solution, providing a feature set which includes broker neutral access to any broker and algorithmic destinations available; global support on a multi-asset, multi-currency platform, working trade analytics, benchmark comparisons in real-time and robust post-trading. The solution will provide a superior experience to both discretionary and non-discretionary clients/portfolios. The Buy-side will have the ability to choose its own sell-side partners, reach any destination worldwide, With ready out of the box connectivity to Bloomberg TSOX, EMSX, DMA, Thomson Reuters ATR, NYFIX, and others, as well as integrated real time global data feeds and corporate actions (splits, dividends, etc.). 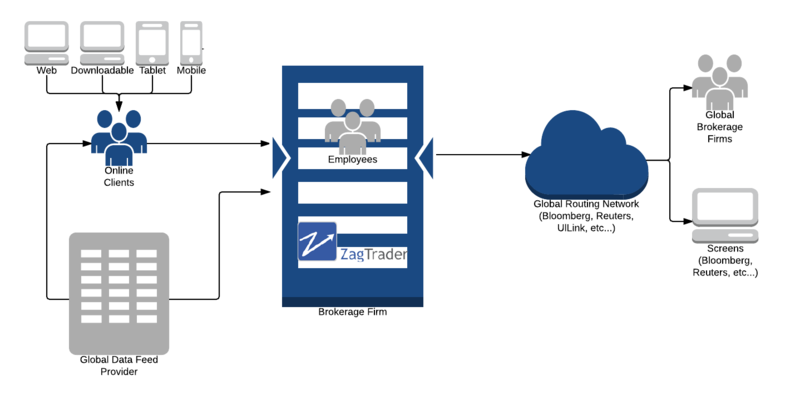 The ZagTrader Buy-side solution can integrate with any back office/banking system without the need to change the infrastructure, or even better, utilize ZagTrader's powerful back office instead! Open architecture: allow the trader to implement their own unique strategies. Provide white label solutions to other financial institutionsSeamless integration with any 3rd party solutions if needed.